← What Really Happened Among The Ja’ss Holes? This article was written by Daisy Luther and originally published at her DaisyLuther.com site. While everyone hopes that situation will never arise, it is important for all gun owners to prepare for that possibility, so that they will be trained and ready to handle the gravity of the situation, and avoid as many stupid or deadly mistakes as possible… because someday it may happen. If you are a gun owner, especially one who carries a firearm on a daily basis, you’ve probably wondered how you would fare if you had to use your weapon in a life-and-death situation. Could you hit a moving target? Would you freeze under pressure? Would you accidentally harm innocent bystanders in your attempt to take down a threat? With virtual simulation training, you can find out the answers to these questions. There are some awesome stories out there in Internetland about armed citizens stopping crimes and protecting lives. In a life or death situation like a mass shooting, each second counts and a firearm can level the playing field and give you a much better chance at surviving than the standard liberal wisdom of hiding and praying. As well, a growing number of homes have guns now – 44% at most recent tally. Unfortunately, it seems like these life and death situations are happening more frequently, as acts of terrorism, civil unrest, and mindless violence continue to plague our country. The qualifications for a concealed carry permit vary from state to state, but generally speaking, you have to take a course that ranges anywhere from 4 hours to 16 hours. Some states require range qualification and others do not. The course that you take is very informative. It explains the laws in regard to using your firearm for protection in your particular state. But, does that really mean that you will be ready to use your firearm in an emergency situation? I am a CCW permit holder in the state of California. I am a single mom and I fully intend to be able to protect my family without being powerless until the police arrive. I practice shooting regularly and take classes with an NRA instructor. I’ve read many books on the topic of carrying my firearm. (I highly recommend this one.) I have had occasion to be very glad that I was armed, but I’ve never had reason to actually use my gun against someone. And that is something which is little understood by anti-gun people: Most gun owners have our guns if we need them, but we sincerely hope to never need them. Of course, this makes you wonder: do you really have what it takes to use your firearm to protect yourself or someone else? Is the training you’ve been doing enough? And how do you find out before the rubber meets the road? The pros have been using virtual simulation training for quite a while. Training simulations are one way to learn a skill that is too dangerous to perform for real. Both the police and the military use virtual reality simulations for training. …With a wide variety of environments, and the ability to insert specific entities into the scenarios, the options for training opportunities are virtually limitless; rehearsals for missions or live-fire exercises are just a couple of examples. Currently, the programmed training environments include mountainous, wooded, and desert. These are intended to simulate places like Afghanistan and Iraq but are not limited to only these specific scenarios. Virtual reality training allows soldiers and police officers to face situations in a multitude of environments with as many different scenarios as you could possibly imagine. And it isn’t all training with guns, either. Users can deploy non-lethal virtual weapons like tasers and OC, making this a good way to test out alternatives to lethal force without putting lives at risk. My firearms instructor is incredibly innovative. (If you are anywhere near Sacramento, you can find her here.) When she discovered a virtual simulation facility within an hour of us, she invited me along to try it out. We headed to Virtual Safe Shot in Fair Oaks, California. Unsurprisingly, the training for civilians is quite different. A strong emphasis of this training is on shoot/don’t shoot scenarios. Not all situations require that your firearm be discharged and because the instructors mix up the situations, you don’t know whether to expect a kid to pop around the corner of your basement stairs or a wild-eyed drug addict. And really, isn’t that how it is in real life? Anyone can imagine being caught up in one of these scenes because they’re taken directly from the headlines. Even though you know the situation isn’t real and that your life is not in danger, you get a surge of adrenaline – you know something is going down, but you don’t know what to expect. Everything that happens, happens fast. The guns at the facility are real Glock 17s that have been modified to shoot only harmless lasers. The recoil is CO2 driven so you get the feel of shooting a gun with real ammo – this means that you must quickly reacquire your target if a second shot is needed. Beginners work with stationary targets and replica pistols, while advanced shooters practice simulations in which they must draw their weapons, move, verbally interact, take cover, and shoot from a covered position. The accuracy of this technology is 4 pixels – that means if you show a hit on the screen, it would have been a hit in real life. Here’s what a virtual simulation is like. The instructors at this facility are retired police officers, which means that they brought something very different to the table: understanding how an investigation will work. Any time you discharge your firearm, even to defend your life or someone else’s, you have to be able to defend your action legally. Unfortunately, I was a little bit trigger happy, something I don’t like to admit. Early on, there were a couple of scenarios in which I would have been better off to wait before firing. And in one very unfortunate situation, I accidentally hit a bystander as well as the criminal. But this was a good learning experience. By the end of my session, my shoot/don’t shoot discretion had greatly improved. I became far more aware of bystanders instead of hyper-focusing on the threat. I would hazard a guess that unless a person has a military or law enforcement background, then like me, they haven’t had much experience making these types of judgment calls. The most important part of this training is the replay. First, you see a readout of how many shots you fired, how many of them were non-lethal hits, how many were lethal, and how many hit someone they shouldn’t have. Even when you know this is only a simulation, it’s very sobering when you see that you shot someone that should not have been shot. Virtual reality gives you a cold hard smack of actual reality and it isn’t pleasant because you immediately realize that in a true emergency, the same thing could have easily happened. Then, the instructor discusses the scenario. You learn what you did wrong and what you did right. They give you tips on improving your strategy and/or accuracy if needed. You discuss how this shooting would look from a legal standpoint, and if necessary, you get the chance to repeat the scenario and do it better. This breakdown of the scenario is an invaluable tool, because in VR, you get a do-over. Not so in real life. I left feeling a little conflicted. I was more confident because of my accuracy, but more aware of the pitfalls of firing a weapon. 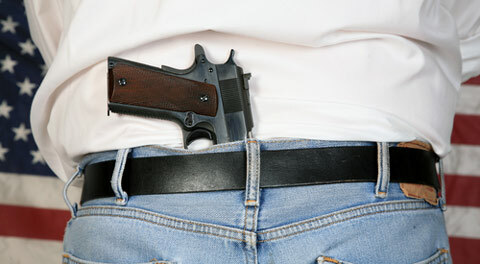 Those pitfalls should be obvious – we discuss them in CCW classes, read about them online, and watch them on the news. But until you see that the shot you fired missed the bad guy and lethally hit the person behind him, it doesn’t make quite the same impression. If you carry, you need some advanced training. I strongly recommend this type of training. I learned a lot and plan to replace 2 of my range sessions each month with virtual simulation training. I believe that if the day ever comes when I must draw my gun to use it, I’ll be far better prepared than I was before I discovered Virtual Safe Shot and the informative, encouraging instructors there. You can play scenarios over in your mind as much as you want, but this is as close to the real thing as you can get. And trust me – you, too, will probably discover that you aren’t as ready as you think you are. This is not a substitute for shooting your real firearm, but it’s an incredible complimentary type of training. This is the level of tactical training that professionals get, and if you can find it in your area, you’ll be far better prepared to use your firearm – or not – should the situation warrant that you do so. This article was posted in Accuracy, Conspiracy Fact and Theory, emergency, Emergency Preparedness, firearm, gun, instruction, intruder, prepared, ready, Training, weapon. Bookmark the permalink. Follow comments with the RSS feed for this post.Comments are closed, but you can leave a trackback: Trackback URL.